(no trip on: 24 Dec-02 Jan). 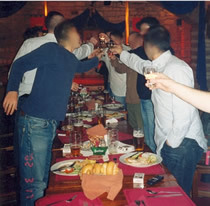 The Stag Dinner & Strip Show is the highlight of many a Prague stag weekend. The event is held in the private area of a local restaurant and bar, reserved exclusively for your group. If you have chosen a trip option with food, we'll then serve you a hearty three course dinner. Next, more drinks flow your way and the lovely Czech girl(s) start their show. There are several shows to choose from (see trip options below). Whichever trip option you choose for your group, all the shows require participation by the stag at the end - with props included! And the best bit: everything is included in the price - there's no nasty bill at the end (which can happen in the strip clubs). Our Prague Stag Dinner & Strip Show is simply great value. Choose from these trip options. A pretty Czech girl performs a special 'Welcome to Prague' strip show, with special help from the groom for the grand finale! Includes: Private bar area + English speaking guide + 1 stripper + 3 beers or wines + celebration shot of alcohol. Price for groups of 10-30 people: £26/€29/780 CZK per person. Two pretty Czech girls work their way around the room, performing striptease shows and teasing various guys. As the performance heats up, they turn to the stag - special help is required from the groom for the grand finale! Includes: Private restaurant area + English speaking guide + 2 strippers performing two strip shows + 3 course dinner (soup, chicken steak with potatoes and apple strudel) + 3 beers or wines + 'Czech Champagne' toast to the stag. Price for groups of 10-30 people: £35/€39/1059 CZK per person. Two pretty Czech girls work their way around the room, performing striptease shows and teasing various guys. As the atmosphere rises, the girls move on to some real lesbian action. Finally, they turn to the stag for the grand finale - our exclusive Lesbo Groom Sandwich, in which the groom plays the part of the meat! Includes: Private restaurant area + English speaking guide + 2 strippers performing two strip shows and a lesbian show + 3 course dinner (soup, chicken steak with potatoes and apple strudel) + 5 beers or wines + 'Czech Champagne' toast to the stag. Full programme lasts 2½-3 hours. Price for groups of 10-30 people: £49/€54.50/1470 CZK per person. From £26/ €29/ 780 CZK per person. -Strippers, drinks & food as per trip options.